Cartographers completed new maps of PaxOku on Homare-jima, Tokuno as the sun started to set across the island. These maps are enhanced to also indicate the building and owner names. Cartographers were ordered by Governor Winfield to keep these maps as up to date as possible each month, and to continue to map each city and outpost of the PaxLair Statehood. PaxLair City continues its immersion in the Realm with as much presence as possible. Come see how many orcish buildings have raise up out of the ground in the historic PaxLair City on Felucca. Why is this happening? What ancient lore and legends are being uncovered? PaxLair City now has an Orcish Mayor -- Mayor Ga'kuct. Why did Governor Winfield really appoint Ga'kuct as the Mayor? What does this mean for the future of PaxLair City? Are the citizens all happy about this? 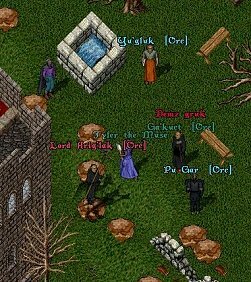 Governor Winfield already received and accepted Minister of Defense Cross MacLeod's resignation because Cross is a Paladin and against the orcs. Will there be war? Will PaxLair City be forced by the new Mayor to only speak orcish? What do the Elves think about that? OOC: PaxLair Statehood is in an Age of Enlightenment, which involves total immersion in the Realm and dealing with situations from the Character perspective. In-game presence makes this happen and offers many unique and unscripted episodes in PaxLair and Chesapeake history. NOTE: This event is a continuing event and publicized at various times to encourage more people to get involved. It is definitely unscripted and spans months of interaction. Do not expect a massive event at any one particular time; such an event may happen naturally based on what is happening in the Statehood. Stay in good communication, watch for alerts, and use the PaxLair UO Automap Server to see where people are on Chesapeake - Server information is on the right side of the http://www.paxlair.com/site10 site. Governor Winfield accepted Cross MacLeod's resignation as Minister of Defense of the PaxLair Statehod in his office on February 22, 2007. The Minister of Defense deals with matters of Protection; recruits and maintains Defense Forces; develops strategies and tactics for combat operations; and performs intelligence operations as required.